For the eight-week period ending January 27, 2009, and based on sales at hundreds of independent bookstores nationwide. There will be three opportunities in February for independent booksellers to help create upcoming Indie Next Lists. W.G. Ellerkamp offers ABA members IndieBound paper merchandise and shopping bags, reusable totes, and a variety of giftwrap designs. 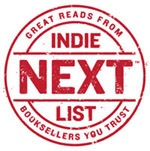 There will be three opportunities for independent booksellers to help create upcoming Indie Next Lists in February. For the eight-week period ending January 13, 2009, and based on sales at independent bookstores nationwide. W.G. Ellerkamp, the supplier of ABA's IndieBound paper and cloth bags, is now offering member stores an expanded line of giftwrap, as well as lower prices on handled paper shopping bags. IndieBound.org's homepage sports a fresh look, including new features and opportunities for fans and indie booksellers alike to get more involved. Among the new additions, Outreach Liaison Paige Poe will be blogging with news and stories about indie retailers across the U.S. All blog entries and articles will be captured in a permanent archive, so they'll always be available. Here's a preview of the February Indie Next List now on its way to ABA member stores in the IndieBound movement. People look forward to all sorts of different things during the holidays. In December, I can't wait for my annual pre-holiday stint working in an indie bookstore. Beyond it being fun, I have consistently found that my holiday bookselling experiences have been indispensable to my work at ABA. For months after I've returned to my day job, my colleagues often hear me start a discussion with a reference to what I saw and what I learned while working in a bookstore over the holidays. Here's a very important reminder for the Indie Next List. Friday, January 9, is the deadline for the Spring Indie Kids' List. Each month, the Indie Next List Notables presents an intriguing range of titles recommended by indie booksellers nationwide. Great POP materials for in-store displays -- electronic files in PDF format of both the January Indie Next List Notables flier and shelf-talkers -- are now available on BookWeb.org. Here's a quick reminder for a very hectic week. For the eight-week period ending December 16, 2008, and based on sales in hundreds of independent bookstores across the U.S.
Want to be a hero to customers hoping to get just the right books as holiday gifts? Just point them to IndieBound.org's Wish List. Anyone who joins the Indie Community can build a wish list of books and e-mail it to friends and family, along with a list of their favorite bookstores.